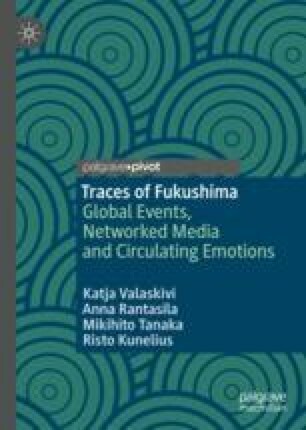 This chapter discusses the temporal aspects of the Fukushima disaster in the immediate aftermath of the disaster. Following the live press conferences of the Chief Cabinet Secretary Yukio Edano, we trace the temporal trajectory of the development of #edano_nero (‘Get some sleep, Edano!’), a Twitter hashtag that was developed by viewers of the press conferences on their second screens. The reading of live press conferences suggests that a disruptive media event can involve strong emotional dynamics and that it can include somewhat surprising registers. Our empirical findings indicate that in the traumatic situation of an ongoing disaster, social media feeds can serve not only as outlets for feelings, but also as platforms for collective emotion formation that form trajectories in time. Asuka Goto from Waseda University has contributed to this chapter. Blommaert, J. (2018). Formatting online actions: #justsaying on Twitter. Tilburg papers in culture studies, Paper 209. https://www.tilburguniversity.edu/upload/5cc3533c-d604-4225-b2e8-057cc45b9dad_TPCS_209_Blommaert.pdf. Accessed 6 Sept 2018. Ichikawa, M., & Deguchi, H. (2012). Falconseed wo tsukatta bunseki project [Analysis project by using Falconseed]. The Great East Japan earthquake big data workshop. Retrieved from https://sites.google.com/site/prj311/event/presentation-session/presentation-session2. Accessed 5 Oct 2018. [Japanese]. Yang, J., & Leskovec, J. (2011, February). Patterns of temporal variation in online media. Proceedings of the fourth ACM international conference on web search and data mining, A conference publication, 177–186. https://doi.org/10.1145/1935826.1935863.